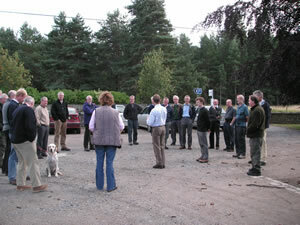 The Upper Deeside Access Trust (UDAT) was established in 1998, and its work is now obvious in many parts of the area. In 2003, it was tasked with spending a substantial part of the £2.4 million of the 3-year EU/HL Eastern Cairngorms Access Project (ECAP) to improve paths in the glens of Aberdeenshire and Angus. This meant a great expansion in its work, and the need for completion before end-2006. UDAT has always had Affiliate Members (AMs), i.e. individuals and organisations (including NEMT) who are interested in its activities, but until recently contact was limited to invitations to annual information meetings, and copies of Annual Reports and the occasional ECAP Newsletter. An exception was a prioritisation exercise in 1999/2000, when user perceptions of greatest need amongst hill paths were surveyed. Given the inherently backward-looking nature of the meetings and reports, feeling grew amongst user AMs that closer contact was desirable, to reduce "surprises" as well-known paths were suddenly transformed with apparently little notice. Hence, in September 2005, I and Alistair Lawson of ScotWays were elected as AM representatives, entitled to attend the quarterly meetings of UDAT's Management Group. This consists of representatives of the main local funding organisations (Aberdeenshire Council, Scottish Natural Heritage, Cairngorms National Park Authority and Scottish Enterprise Grampian) meeting with UDAT officers (Andrew Coleman, Murray Swapp and Kevin Fairclough). What did we AM reps learn, and do, over the year? Alistair and I took turns to convert the official minutes into a less formal Affiliates' Letter sent electronically to all AMs, and this should have accelerated the transfer of information. Even so, the pace of work, and the uncertainties of project management (specification, planning permission, costings, tender invitations, contracting, coordination, completion, ...) meant that not everything was reported, or took place as forecast. And of course AM organisations are only as good as their own communications! We had little influence on the pattern of UDAT activities; that was largely fixed (especially in the hills) by ECAP, and the technical side of path and bridge construction etc. is esoteric and fast-developing. Perhaps we did ask the occasional question or mention the occasional issue from a user point of view, and we hope that some response was evoked. UDAT strategy is in the hands of its Board, which consists of Pat Chalmers, Robbie Middleton, Peter Ord and Marcus Humphreys, who of course have depended on the professionalism of UDAT staff (primarily Andrew Coleman) in analysing longer-term possibilities, and on available funding. We AM reps have played no part in this debate; perhaps we should have asked more questions! The setting-up of the Cairngorms National Park has obviously changed the entire context, and at time of writing, UDAT awaits a decision of the Park Authority as to how it sees the future of path management in the whole Park area. (The much-trumpeted award of £100,000 on 8 September  two days after the UDAT AGM  was merely old news recycled). Furthermore, Andrew's move to Cumbria in early 2007, and his part-time substitution by Chris York until end-2006, will obviously alter the personal context. During 2005/06, Alistair and I were always slightly troubled by our mutual similarity as out-of-area residents with primarily longer-distance walking interests at heart. For this and other reasons, Alistair decided in summer 2006 to stand down, and was replaced at the 2006 Annual Meeting by Robin Blyth of Ballater Community Council. Robin and I hope that together we can bring a more balanced and more active component to UDAT's proceedings. On a personal note, I now wonder if pushing path restoration into the remoter areas has gone far enough. I am troubled by the possibilities that both the main Cairngorm Lairigs, (both of course mostly in NTS territory) will be "improved" beyond recognition, with implications for the use of mountain bikes (recently sighted halfway up the Sron Riach) and more wildlife disturbance higher up. That is perhaps for debate beyond - but including  UDAT and NEMT. Now that most of the obvious hill paths have been attended to, the nature of UDAT-type work may have to change. It has been suggested that erosion by climbers using the crags in this area is now getting so severe that measures to halt and restore the damage are becoming necessary. The Cairngorm Club is co-ordinating a proposal to appropriate organisations and would be glad to hear of any ideas, experiences and/or support (verbal, or possible funding) for this initiative.